Alfa Laval Air-Cooled Exchangers, historically known as ACE, is undergoing a major transformation. ACE, founded in 1964, enjoyed nearly five decades of success in the manufacture of air-cooled heat exchangers under private ownership. Although its products and processes served ACE well over that time, a much needed renewal began after the company was acquired by Alfa Laval in December 2012. Among the world’s oldest industrial companies in continuous business, Alfa Laval’s roots date to 1883, when founder Gustaf de Laval started a company in Sweden to manufacture his new centrifugal cream separator that was marketed to dairy industries throughout the world. Today, a third of the way into its second century, Alfa Laval is a global supplier of products for heat transfer, separation and fluid handling. Key products — heat exchangers, separators, pumps and valves — are used in many diverse industries including the manufacturing of food, chemicals, pharmaceuticals, starch, sugar, ethanol, nuclear power, marine vessels, mining, refineries, wastewater treatment and indoor climate control. The acquisition of ACE strengthened its position in the oil and gas and power industries. ACE moved to its current Broken Arrow, Oklahoma, location in 1974. 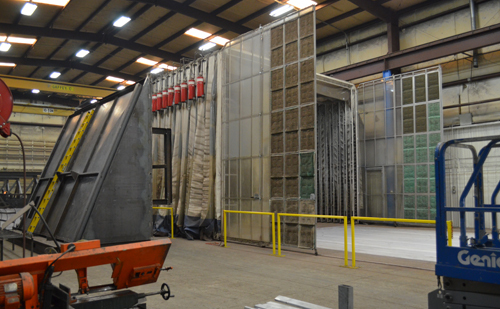 Over time, this grew into a multiple-building facility that covers 150,000 sq.ft. (13,936 m2) under one roof on 18 acres (7.3 ha). Notably, ACE celebrated its 50th anniversary in 2014, just as the oil and gas industry was headed into one of its worst downturns in decades. ACE’s core market is wellhead gas compression, but the company also manufactures air-cooled heat exchangers for the entire oil, gas and power spectrum from the upstream through the midstream and the downstream supply chain. “More than 50% of our business is now engineered coolers for midstream and downstream markets including pipeline compressor stations, LNG peaking facilities and power generation,” said Misty Ingle, inside sales manager. Wellhead compression is still very important, but diversification has made the company stronger through the business cycles. With a focus on safety, quality, delivery and cost, ACE’s intensive transformation extends from order entry, through engineering, manufacturing and product development. A computerized order data sheet linked to an automated engineering process can generate drawings and bills of material in minutes, allowing sales engineers to select from literally billions of possible combinations of features and options for each cooler frame size. Drawing files are downloaded directly to CNC machines for burnout, header production and machining. Through a series of carefully phased steps, the factory is being steadily transformed from a legacy of mature, discontinuous and erratic production flow with old machinery into a modern, well-organized, safe and efficient operation. Custom-designed to meet specific customer specifications, Alfa Laval ACE air cooled exchangers are engineered for the upstream, midstream and downstream oil and gas markets. Increasing efficiency and reliability calls for broad expertise, technologies and services. Alfa Laval’s solutions for turbine-driven power plants help secure stable, economical supply of electricity. Oil and gas operations are all about constantly optimizing process performance while maintaining safety for people and the environment. This new CNC burn and bevel table, installed in Alfa Laval ACE's Broken Arrow, Oklahoma, facility last year, increased productivity and throughput by a factor of three. 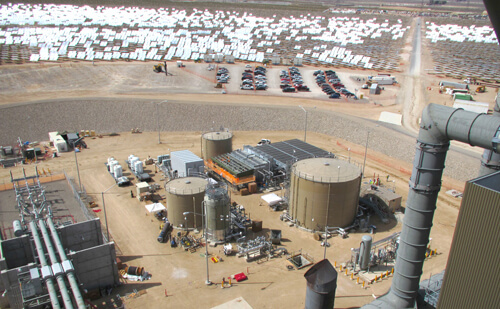 Six large ACE Model E-air cooled exchangers support a large central gas gathering pipeline compressor station. “Our entire manufacturing operation was thoroughly mapped with our extended team’s input, emphasizing the customer connection,” said Mark Gorgas, factory manager. “With a cultural transformation, our … workforce is helping drive continuous improvement.” This is evident throughout the facility with job tracking, visual backlog and job status prominently displayed in each department. To meet the quick deliveries that customers demand, ACE manufactures nearly all the components that go into its coolers, including not only the structure and headers, but also the louvers and fin tubes. A number of new CNC machines have been added with more on the way. Gorgas said a new CNC burnout and beveling machine increased productivity and throughput by a factor of three. Ten tube finning lines keep up with peak production needs, and an improved tube rolling process has resulted in fewer leaks and failures and more consistent production. Three separate assembly lines have been developed for small, medium and large coolers. 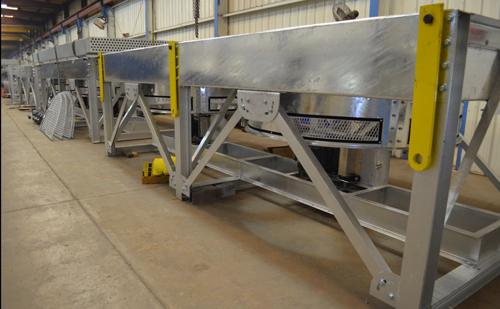 Portable, expandable paint booths allow painting the coolers in line without extra handling. Gorgas and his team stress safety, organization, tool storage and proper identification and maintenance of all utility services throughout the plant. Modern metalizing and painting processes have been implemented to improve environmental compliance and safety, and storage has been improved to better utilize available space and ensure accessibility. ACE provides a full range of air-cooled heat exchanger products. Its Model A has vertical, sloped sections with a horizontal-forced draft fan with vertical air ejection. The sloped sections provide an optimized center of gravity for safer loading and transport. Offered with fan diameters from 2 to 14 ft.(0.6 to 4.3 m), this model typically supports engine drive compression applications from 50 to 1500 hp (37 to 1119 kW). Model J has vertical sections with an induced draft fan and vertical air ejection. With fan diameters of 2 to 14 ft. (0.6 to 4.3 m), it typically supports engine drive applications from 50 to 800 hp (37 to 597 kW). The smaller Model C with vertical sections and fan with horizontal air ejection is an economical and compact alternative to vertical air ejection models. It typically supports engine drive compression applications from 50 to 400 hp (37 to 298 kW) with fan diameters of 2 to 10 ft. (0.6 to 3.1 m). Models E and T support larger applications. Model E has horizontal sections and fans with vertical air ejection. It is available in single- to four-forced or induced draft fan configurations with electric or hydraulic drives. Fan diameters range from 2 to 34 ft. (0.6 to 10.4 m). Model T has horizontal sections and vertical forced draft fans with vertical air ejection. It is available in single- to five-fan configurations with diameters from 2 to 14 ft. (0.6 to 4.3 m), typically matched to engine drives from 50 to more than 4500 hp (37 to 3356 kW). Its relatively narrow width enables increased transportability. Aluminum fan guards are available on both models for increased maintenance safety and weight reduction. Shown here is one of three portable and collapsible paint booths installed by Alfa Laval ACE in 2015. The paint booths are moved into position on tracks built into the floor, allowing coolers to be painted in line without extra handling. Three large two-fan Model E coolers shown in one of the assembly lines at Alfa Laval ACE's Broken Arrow, Oklahoma, facility. The new ACE modular, compact, V-type cooler with sloped sections and standardized horizontal fan assemblies reduces plot space and reduces operating costs due to optimization of motor/fan power consumption. Standard variable frequency drive motor-driven fans are prewired to a control system on the unit. Available with section lengths up to 60 ft. (18.3 m) with two to nine pairs of 3 to 6 ft. (0.9 to 1.8 m) diameter fans, the induced draft, vertical discharge design reduces noise, increases safety and reduces transportation costs relative to conventional solutions. Shown here is the Alfa Laval wet/dry hybrid auxiliary cooling system installed at the Ivanpah solar electric generating system in California’s Mojave Desert. Operated by NRG Energy, the system began commercial operation in 2013 and delivers power to PG&E and Southern California Edison. The Alfa Laval hybrid system was created to maximize site water conservation while still enabling consistently low process outlet temperatures during all seasons by running dry during cooler ambient periods, then utilizing available water only during the hotter summer ambient air temperatures. An Alfa Laval Niagara wet surface air cooler (WSAC) is combined with an Alfa Laval ACE dry air cooler to maximize system efficiency while taking advantage of fluctuating ambient air temperatures. Another aspect of ACE’s transformation is in product development. In 2015, ACE introduced its Model V air-cooled exchanger for power generation and other upstream and downstream applications. 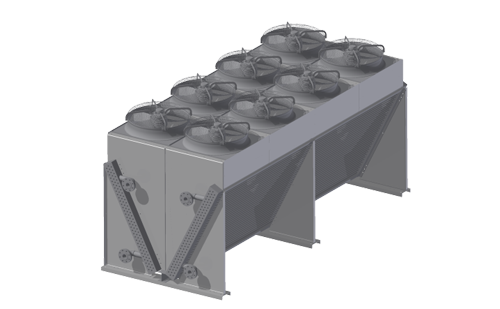 The modular, V-type cooler with sloped sections and standardized horizontal fan assemblies reduces plot space and reduces operating costs due to optimization of motor/fan power consumption. Standard VFD motor-driven fans are prewired to a control system on the unit. Optional hydraulic drives are also offered. 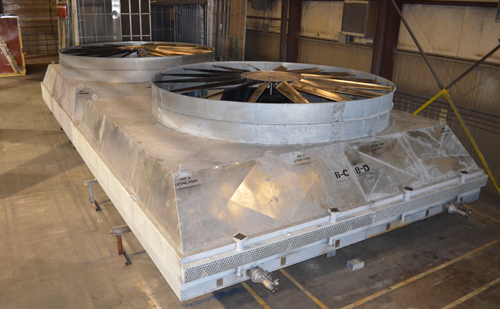 Available with section lengths up to 60 ft. (18.3 m) with two to nine pairs of 3 to 6 ft. (0.9 to 1.8 m) diameter fans, the induced draft, vertical discharge design reduces noise and increases safety relative to conventional solutions by inherently eliminating confined space entry requirements. It also reduces transportation costs as the compact design fits within standard shipping containers for international applications. Smart controls are another ACE development that can be applied to most of its cooler models. The factory-installed motor controls eliminate the need for plant motor control centers, which reduces installation costs for customers. Seeing a need and an opportunity for reducing the power consumption of cooler fans, ACE introduced its Vspeed magnetically modulated adjustable speed fan drive in 2016 (see June 2016 COMPRESSORtech2), which is designed for engine and electric motor-driven cooler fans. Another recent development is the Alfa Laval wet/dry hybrid auxiliary cooling system. It’s a system design approach created to maximize site water conservation while still enabling low process outlet temperatures. To reduce a site’s cooling water usage, typically influenced by cooling tower consumption, an Alfa Laval Niagara wet surface air cooler (WSAC) is combined with an Alfa Laval ACE dry air cooler to maximize system efficiency while taking advantage of fluctuating ambient air temperatures. This allows for a consistently low process outlet temperature during all seasons by running dry during cooler ambient periods, then utilizing available water only during the hotter summer ambient air temperatures. Unlike typical cooling tower solutions, poor quality water can be collected and reused up to 10 times with the hybrid system. Alfa Laval provides total system responsibility for thermal performance. Further transformation has occurred in the development of an expanded service portfolio. ACE offers a suite of performance agreements and service offerings that include startup, monitoring, maintenance, improvements, upgrades, retrofits and support. 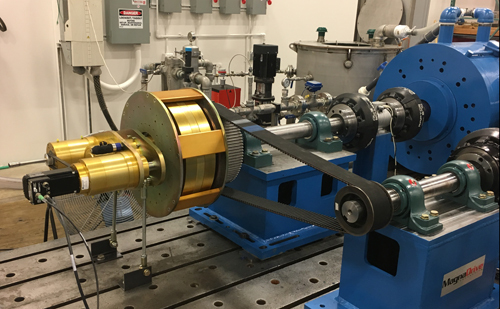 Shown here on test is the ACE Vspeed magnetically modulated adjustable-speed fan drive that was introduced in 2016. It can be applied to both new and retrofit applications of engine and electric motor driven cooler fans. A two-fan Model E horizontal cooler is in process in the large cooler assembly line at Alfa Laval ACE’s plant in Broken Arrow, Oklahoma.